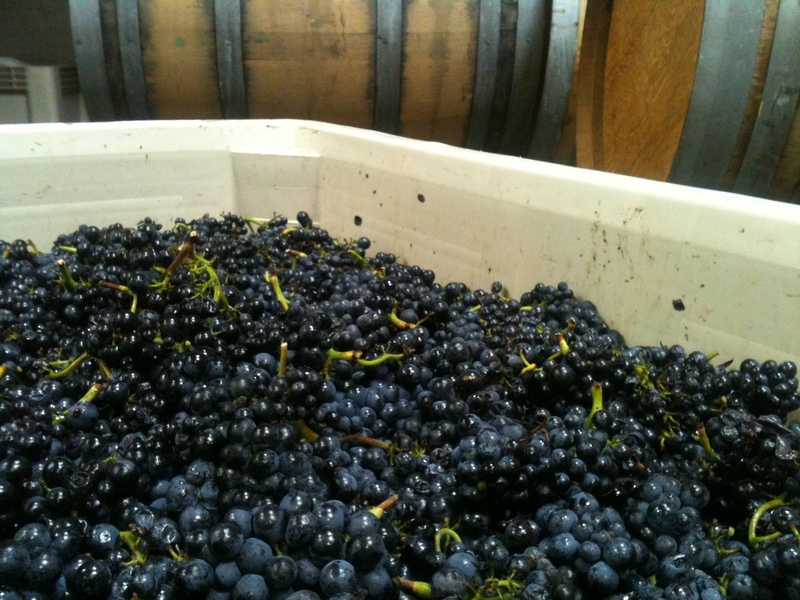 It’s October 15 and we still are waiting for more pinot noir fruit to get picked and sorted in this 2011 vintage. Today, we sorted our Russian River Valley pinot noir fruit from the vineyard formerly know as Archer Family Vineyard (it was recently sold and new vineyard name is TBD). Usually RRV fruit comes in sometime in mid-late September. The fact that you have Sonoma fruit getting picked in mid-October tells you what a crazy growing season this has been. Not only did the cool summer push back the phenolic development of the grapes, but the rains in early October caused ripening to stall momentarily. In some cases, it pushed back the ripeness, with sugars going down. And then, when you get a region like Anderson Valley, where our grapes have come in normally in late September to early October, things are getting pushed back even further. We are still awaiting another lot of Anderson Valley pinot noir, with our Wentzel fruit scheduled for pick on Monday the 17th. 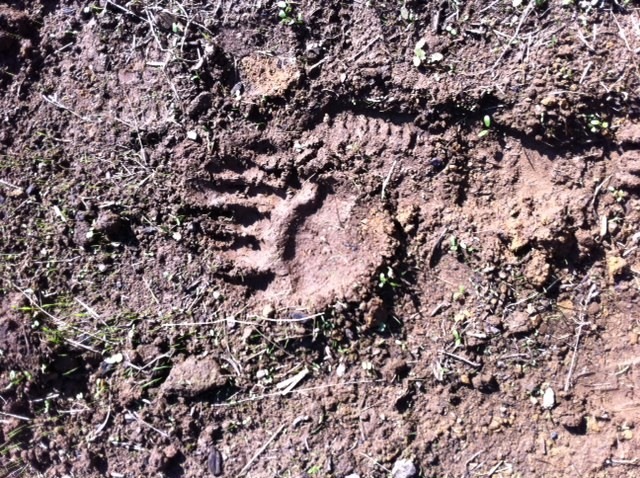 And did we say bears? Yes, bears. A little visitor has consumed a few pinot noir clusters at Wentzel Vineyard, further challenging the final yield of the vineyard. Suffice it to say, we are lucky to get our little ton of pinot with all the challenges the year has brought. 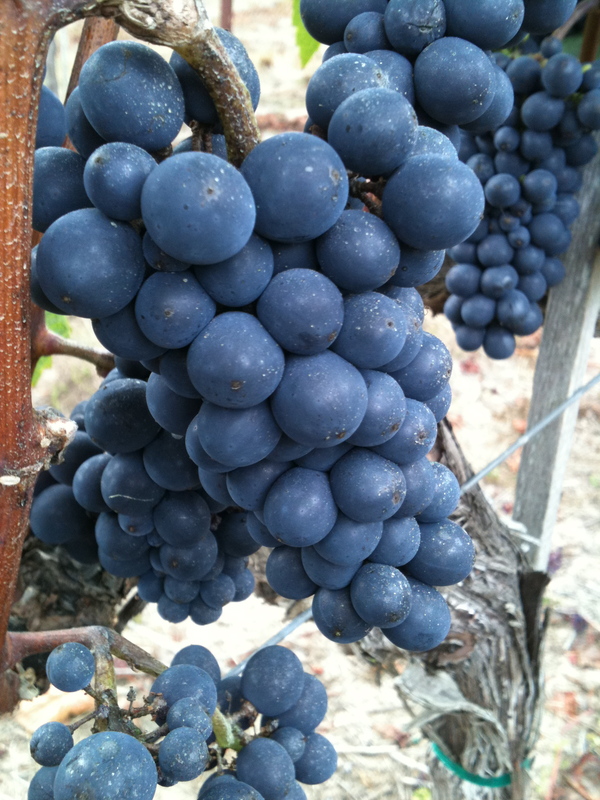 Despite all the challenges or idiosyncrasies of the 2011 vintage, the fruit looks *and* tastes good. For growers overall, yields are down due to shatter, dropped fruit because of mold or lack of ripeness and general damage from the rains, but what remains after this close attention to quality are excellent grapes that hopefully are benefiting from an additional two to three weeks of hang time. As Bonne notes in his own 2011 harvest update, more hang time (and cooler growing conditions) means more complexity and more balance. At this point in October, we’ve normally harvested the majority if not all of our pinot noir from the different appellations with which we source fruit. As of today, we’ve only pulled in one lot of 115 clone pinot noir from Londer Vineyard, and we’re still awaiting the other clone from Londer, Swan, both from Anderson Valley. Nor have we picked our blocks from Wentzel in Anderson Valley, Oppenlander in Comptche and Vineyard 11 (formerly Archer Family) in Russian River Valley. 2011 has proven to be another cool year – similar to 2010, but with a couple of more challenges, or as we like to think about them, opportunities for distinctive wines. 2010 was a very cool growing year in Northern California, especially in the coastal climates, but there were a few heat spikes in August and September. 2011 has been consistently cool, with fewer and less intense warm periods. This has pushed harvest dates out further than last year. Also adding to the delays have been a couple of rain storms that hit last week across California. If you didn’t get a crew to pick your fruit (often a challenge when everyone wants to pick on the same day) before the rains hit, you have to wait at least a couple of days if not more to let the fruit dry out and avoid any bunch rot. The last of the rains were on Thursday and the earliest we expect to get fruit is on Monday the 10th. We took a whirlwind trip up to Philo last weekend, staying just over 24 hours, to check out our blocks from the Anderson Valley and Comptche vineyards. Our first stop was Wentzel Vineyard, where upon arrival it was misting rain. We checked in on our the small block called “the clos” from which we get a blend of Dijon clones (114, 115, 667, 777). 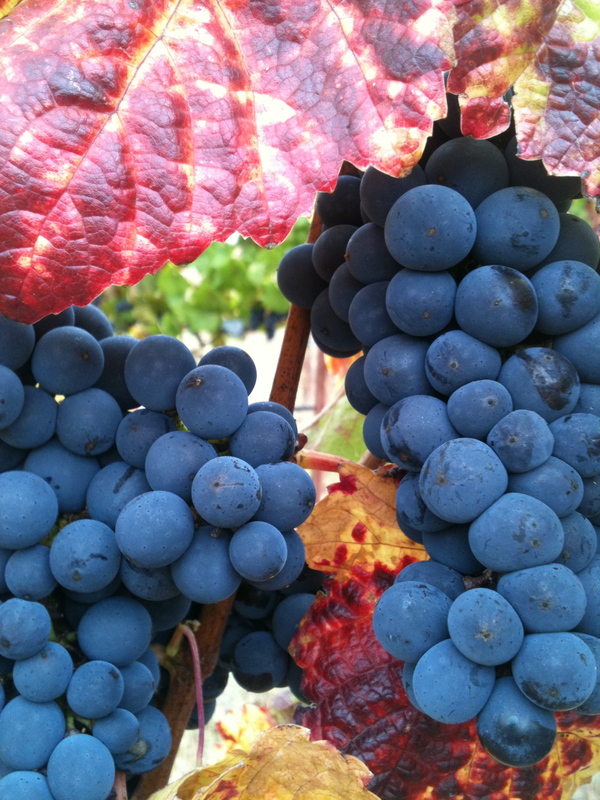 The most recent measurement of the sugars in the grapes, measured in Brix, was just over 21 Brix. A target zone that we look for in Brix is 23.5 – 24.5 Brix. We’re not die-hard about the numbers, because you have to look at other important factors: acidity, flavor, color and consistency of the seeds, and finally your gut feeling. The berries tasted good and the seeds are starting to get crunchy, so it’s getting there. With the rains coming in and a slow, cool season, we are predicting the Wentzel will come in late this coming week of the 10th. We took a drive over to Londer Vineyard, further West of Philo, on Sunday morning; clouds were breaking up and the sun was starting to shine. Londer has been partially picked, but the Swan clone usually comes off the vines last. The yield on these vines looks pretty good, despite some shatter (when a grape cluster doesn’t fully mature due to early season growing conditions like cold and wind) and there is a mix of clusters with small berries and some with large berries. The Swan clone is further along, around 23 Brix, and we were getting more flavors from these given that they are closer to ripening. We expect the Swan clone to come in early this coming week. After a brief visit with Shirlee Londer (and their dogs, which kept our 5 yr old daughter entertained), we took the windy road up to Comptche, about 30 minutes north of the valley, to check out Oppenlander. In the past we have gotten 114 clone from Oppenlander, but we heard of the possibility of some Pommard and 115. 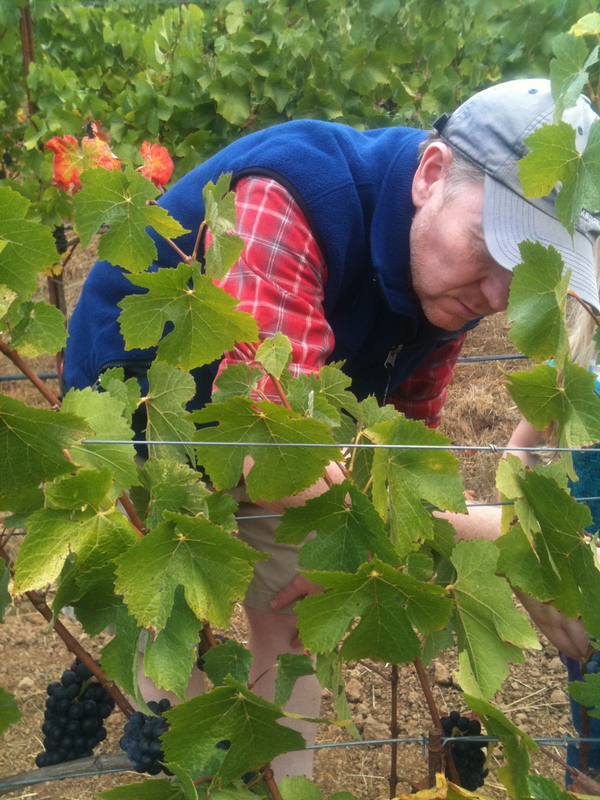 We checked out all the vines, tasting berries up and down the rows, and Oppenlander is also looking good. Very minor puckering from the few warm stretches that we’ve had late in the summer. All the vines have a good canopy, which perhaps helped a little bit during the heavy rains in the last week. We will be getting a blend of 114, 115 and Pommard from Oppenlander on Monday the 10th. Also on Monday, we’re likely to get our pinot (828 clone) from Vineyard 11 near Windsor in Russian River Valley. So it will be a busy couple of weeks at the winery with only one bin fermenting (Londer 115 on its native yeast) and 4+ tons coming in. After that, we’ll be pressing late into the month. We’ll keep you posted on how the rest of the fruit looks when it comes in in our next harvest update.